Earlier this week, Georgia’s Facebook page exploded with reports of the arrest of former President Mikheil Saakashvili on a Greek island, either Santorini or Kos. The revelation coincided with an announcement by the Greek Chief Prosecutor’s Office that Saakashvili was the target of an international and that Interpol had issued a red notice for him. However, it appeared that the two events are unrelated. Saakashvili, whose pleasure-seeking tendencies are well-known, allegedly attracted the attention of Greek police with his overly emotional behavior, and not for the reasons law enforcement agencies announced. To recap, Georgia’s former head of state is charged under several articles: abuse of power in his harsh suppression of opposition rallies, confiscation of assets of the late tycoon Badri Patarkatsishvili, embezzlement from his Imedi television company, and embezzlement of $ 10 million from the national treasury. This is not a comprehensive list of legal violations. It can be lengthened considerably. A study of the causes of the war in August 2008 and Georgia’s defeat in it is not yet complete. There are questions for the ex-president about the investigation, about the murder of a young bank clerk Sandro Girgvliani by senior officers in the Interior Ministry and about the death of Prime Minister Zurab Zhvania. Investigators are focusing on businesses close to Saakashvili, his closest relatives and his estate and also the costs of the president’s foreign trips and private trips. The announcement that Saakashvili was being sought occurred after he twice refused to show up at the prosecutor’s office to testify and answer investigators’ questions. All of that was going on at the same time Saakashvili was in Ukraine making anti-Russia and anti-Putin speeches. That coincidence allowed his supporters to accuse Georgian authorities of taking cues from the Kremlin. Even Saakashvili gladly latched on to that narrative, specifically accusing his chief opponent, former Prime Minister Bidzina Ivanishvili of working on Putin’s behalf. “I pose a threat to the Russian president, and marking me as a wanted man hinders me from going around the world in the fight against Russian totalitarianism,” Saakashvili said at a Ukrainian rally. In private, people close to the former president suggest that he seems to genuinely believe that he has a messianic calling for opposition to Russia, so naturally he takes the side of the West. 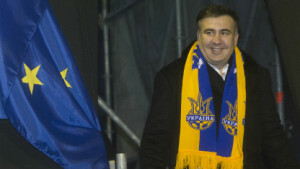 However, Saakashvili exaggerated his problems. His freedom to travel the globe has not been inhibited in any way. Georgia has so far been unsuccessful in getting him put on Interpol’s wanted list. Perhaps that explains why Saakashvili was defended by influential American senators and a number of European politicians. But the former president has noticeably fewer famous “advocates” than he did before. Georgia’s new government is not remaining idle in the international arena. It held several meetings in Washington and European capitals, and prominent Western lawyers were invited to Tbilisi. And it is evident that at all these get-togethers, Georgian officials provided documented proof of some of Saakashvili’s misdeeds. Even if it’s something as trivial as his purchase of nine expensive suits during the nine years of his presidency. The long and the short of it is that to one degree or another, Saakashvili’s successors have become convinced of his culpability. There aren’t as many people defending him. However, the possibilities that are still left apparently are enough to ensure that the former Georgian president’s life won’t be all that dull. Now the question is whether there are enough of them to override Tbilisi’s intention to put him on the international wanted list. But even if the Georgian authorities’ plan works out, there are still doubts that Saakashvili will be arrested in any European country at Georgia’s request. Not to mention the United States or Ukraine, where he has most often been in recent years. The new plan by Georgia’s chief prosecutor, observers note, appeared almost immediately after Saakashvili met with members of the United National Movement (ISNA) at the Georgian-Turkish border. He was on the Turkish side, of course, where he was safe from arrest. During the “exit conference,” Saakashvili criticized Georgian authorities, predicted the downfall of the country in the near future, and indeed instructed his audience to establish new political and social movements capable of fighting Ivanishvili, the government and the parliament. These “subversive” activities by Saakashvili, according to some experts, have all the members of the UNM very concerned about the billionaire Ivanishvili. A prominent representative of UNM, David Darchiashvili asserted that “this oligarch has orchestrated a bloodless coup in Georgia as ordered by Putin. He is afraid of Mikheil Saakashvili and will not rest until he sees the ex-president behind bars, right next to the former prime minister Vano Merabashvili, former Tbilisi Mayor Gigi Ugulava, former Defense Minister Bacho Akhalaia and other leaders of the United National Movement.” However, the view that Saakashvili is the victim of political persecution is held only by the UNM and a few NGOs and experts close to the former ruling powers. Most of Georgian society believes that the former president and his party are the main culprits for the ills of the country. However, there are individuals who have their own explanation for what is happening. Konstantin Chikviladze, a lawer and expert on Russian-Georgian relations, is certain that the Georgian government is staging “a cynical farce” for the public. “I am convinced that the new Georgian leadership, like its predecessors, is a submissive lackey of the United States. In all its actions and doings, it is guided by the directives of its patron. The demonstration of its willingness to bring Saakashvili to justice is a message primarily for domestic consumption to convince the people who fully believed pre-election promises that something is being done the sake of justice,” Chikviladze told a correspondent for NVO. According to him, the authorities are well aware that the West is not keen on arresting Saakashvili. He’s their guy. They haven’t cast him aside, and therefore Georgia is not going to get involved in a confrontation with the United States and Europe. “International hunt,”red notice,” they’re nothing but hot air. Even if Saakashvili is added to Interpol’s wanted list, I don’t think he will stand trial in Georgia,” concluded Chikviladze. He also dismissed the reports that Saakashvili had been arrested on Santorini or Kos. “According to my information, those are rumors. There were no incidents involving him. And he wasn’t even on those Greek islands on the days in question,” said Chikviladze. All the same, where there’s smoke, there’s fire. Georgia’s ambassador to Greece, David Bakradze, said that a yacht had recently been detained with Saakashvili and former Ajarian leadr Levan Varshalomidze aboard as they were sailing from Turkey to Greece. Bakradze had difficulty providing an exact reason for what prompted the stop, but he said that if the Greek police had stopped the boat at Georgia’s request, they had no right to prolong the detention because the protocol for declaring Saakashvili a wanted man had not been carried out. As a result, the yacht stayed on Samos for about four hours and then set off in the opposite direction, toward Turkey.